“Cash Crate”, found at cashcrate.com, is an online paid surveys site with a very questionable reputation. CashCrate pays anywhere between 30 and 75 cents per survey. With Cash Crate, it takes a very long time to reach the minimum payout and many people complain they don’t get paid when they finally do reach the minimum pay out amount. Unfortunately, you have to spend money to get a small percentage back on what you pay. 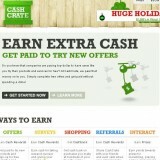 Cash Crate makes their money by having you sign up with their endless partners’ product trials. They hope that you forget your credit card will be charged after the free trial expires, so you end up paying their partners’ costs for the mediocre products you have to sign up for in order to take the surveys. Once you give out your credit or debit card info to any of these sites for a “trial” offer, make sure you get a hold of your bank and cancel or reverse any charges they try to create. If you don’t, that could add up and may affect your credit. I was so amazed by the amount of rip off reports, complaints comments and other bad reviews that I believe CashCrate should be considered a scam. Furthermore, the amount of links I found of the company defending Cash Crate is equally astonishing. If you choose to ignore my recommendation not to pursue Cash Crate, make sure you create a junk email account just for working with Cash Crate. You will see just how fast it will fill up with junk from Cash Crate after you sign up. Honestly, the only way you will make any money is by becoming an affiliate partner and spamming others with offers, which of course I highly suggest you don’t do. If you are ok with being known as a scammer, by all means join the CashCrate affiliate program. Otherwise, stay very far away from Cash Crate. I do not recommend “Cash Crate”.